Eisenhower dollars are also known as "Ike Dollars" or "Ikes." 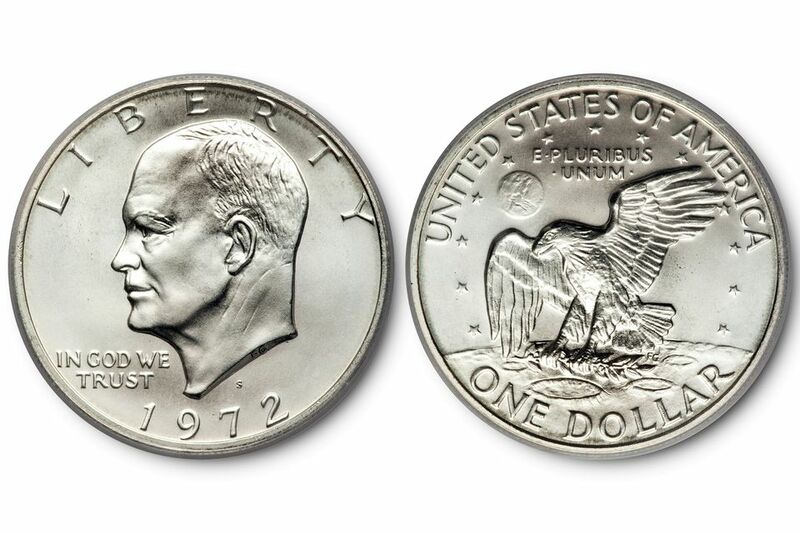 They were first minted in 1971 to celebrate the United States accomplishment of landing the first human on the moon. Since it was President Dwight D. "Ike" Eisenhower who ultimately authorized the creation of NASA in 1958, it was decided that his portrait would adorn the obverse of this new U.S. dollar coin. Other people believe it was to compensate for the hastily implemented Kennedy half dollar coin. In 1975 the United States Mint began coining dollar coins bearing the duel date 1776-1976 to celebrate the bicentennial anniversary of the American Revolutionary War. The Mint produced the bicentennial dollars through the end of 1976. Therefore, there are no Eisenhower dollars dated 1975. Overall demand for these circulating dollar coins was deficient and in 1978 the last Eisenhower dollar was minted. The mint replaced these large dollar coins with the new smaller Susan B. Anthony dollar. Unfortunately, the new smaller dollar coins did not circulate any better than the big Ike dollars. Assembling a complete set of Eisenhower Dollars by date, mint mark, and popular varieties requires a total of 34 coins. Since these coins are no longer made and rarely found in circulation, you'll have to buy your coins through a coin dealer. The only place where these coins regularly circulated was in the casinos on the West Coast of the United States and the occasional Christmas gift to a child. Therefore, most circulated examples can be obtained for a small premium over face value. Most uncirculated examples can be purchased for around $10.00USD. The mint also produced many issues specially minted for coin collectors that sell for reasonable prices. The 40% silver issues are usually influenced by the current spot price of silver. The beginning collector should start by assembling a date and mint mark set of business strike coins in either circulated or uncirculated condition. Don't worry about the special collector issues, proof coins, and various die varieties. Although they are not expensive, they can add some time and money to assemble a simple collection. The intermediate collector will assemble a collection of coins that not only include the date and mint mark set of business strike coins, but should also include the special collector issues, and proof coins. Your collection should include business strike coins in uncirculated condition. The advanced collector will strive to assemble a complete collection of Eisenhower dollars by including all business strike issues, special collector coins, proof coins, and more popular die varieties. The discerning collector will strive to find the best quality business strike and proof coins available. The special collector issues will be top-notch and without toning or environmental damage. You'll find that most coin dealers have an ample supply of both circulated and uncirculated coins. If you are an advanced collector, the uncirculated coins may require some searching across several dealers to find the date and high-quality grade that you are looking for at a price you are willing to pay. Finding uncirculated examples that have relatively few bag marks will require some searching. Do to the coin's large-size and weight, bulk handling of the coins after production took its toll on the coins surface. Look for a good strike and excellent eye appeal when selecting specimens for your collection. The intermediate and advanced collector will endeavor to find coins that are well struck and have minimal bag marks on them. You can tell if a coin is well struck by looking at the obverse side and inspecting the area on Eisenhower's lower cheek line. Additionally, look at the fields of the coin for an incomplete strike where mint luster is lacking. Advanced collectors will also want to add proof issues to their Eisenhower Dollars collection. United States Mint struck Proof coins in all production years from 1971 until 1978, and 40% silver issues were produced from 1971 until 1976. Additionally, you should collect the three different die varieties of Ike dollar business strikes that were produced in 1972 for circulation. As time progresses, more die varieties are being found and are becoming popular with collectors of Eisenhower "Ike" dollars.